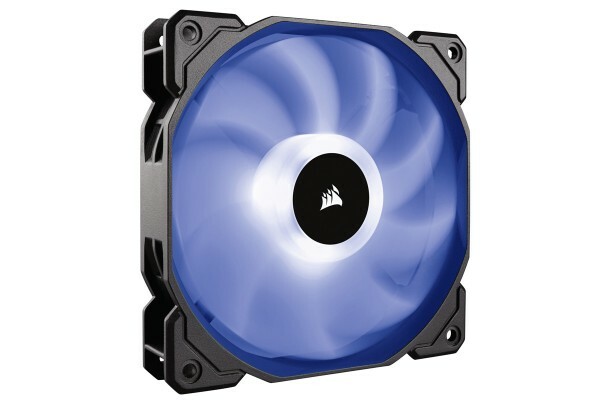 CORSAIR SP120 RGB LED PC-case fans combine striking RGB LED light effects with high pressure airflow - guaranteed to make your system stand out. Quiet yet imposing, the SP120 creates a dramatic look for your system. The specially-modelled blades are translucent with a frosted finish, and create an impressive effect when combined with the four RGB LED lights. Simply connect, and enjoy playing with the pulsating light effects and lively animations the SP120 offers. Four centre-mounted RGB LED lights and translucent fan blades with a frosted finish make for bold illumination with lively light effects. Comfortably navigate through all light effects, speeds, and colours. La lumière n'est pas aussi homogène que le laisse penser la photo mais le résultat est là. Excellent débit d'air et très silencieux. Je l'utilise dans un watercooling et les performances sont au rendez vous.